A sequence of three official photographs of Her Majesty The Queen, by the renowned portrait photographer Annie Leibovitz, will be released today, 21st April, to mark Her Majesty's 90th Birthday. The photographs were taken at Windsor Castle just after Easter. The first in the sequence features The Queen walking in the private grounds of Windsor Castle. 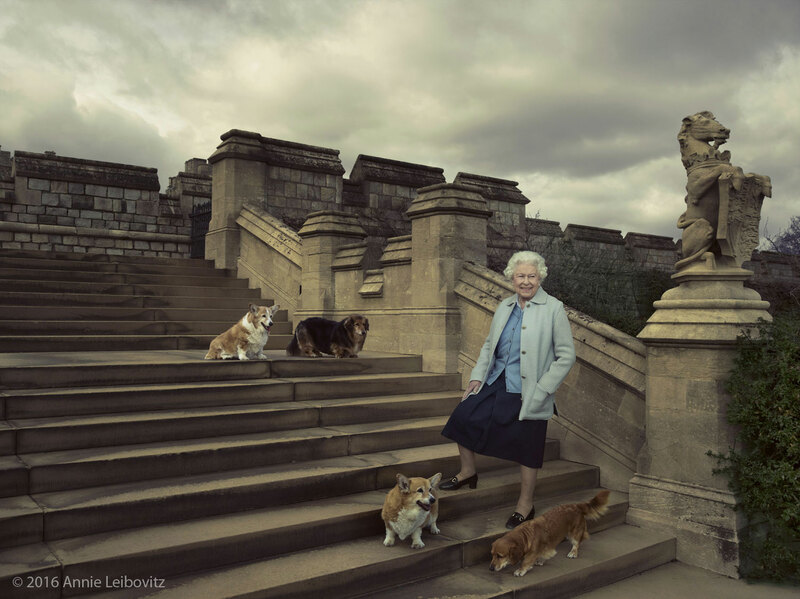 The Queen is seen on steps at the rear of the East Terrace and East Garden with four of her dogs: clockwise from top left Willow (corgi), Vulcan (dorgie), Candy (dorgie) and Holly (corgi). 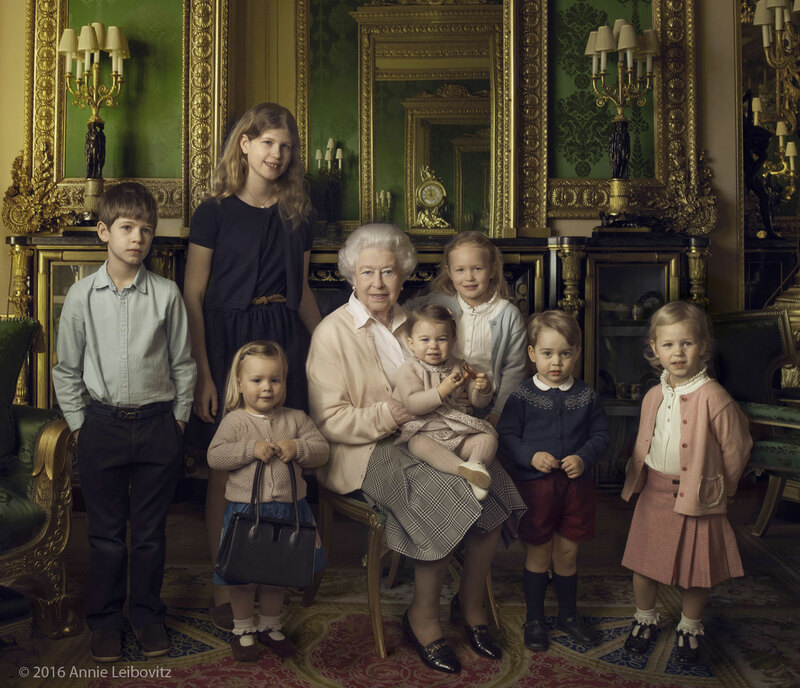 Mia Tindall (holding The Queen's handbag), the two year old daughter of Zara and Mike Tindall; James, Viscount Severn (aged 8) and Lady Louise (12), the children of The Earl and Countess of Wessex and the youngest of The Queen's eight grandchildren; Savannah (5) and Isla Phillips (3 at time of photograph), daughters of The Queen's eldest grandson Peter Phillips and his wife Autumn; Prince George (2) and, in The Queen's arms and in the tradition of Royal portraiture, the youngest great-grandchild, Princess Charlotte (11months), children of The Duke and Duchess of Cambridge. 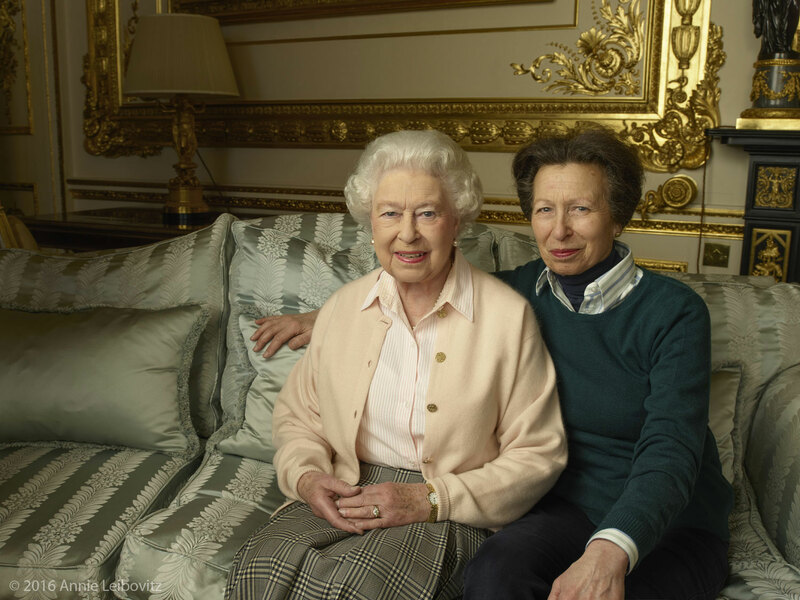 The third portrait in the sequence is of The Queen with her daughter The Princess Royal, taken in the White Drawing Room at Windsor Castle.